Imagine a battery that could live up to 400 times longer than today’s power cells. Now, imagine making that discovery while trying to develop something else. That is what researchers from the University of California, Irvine published last month in the American Chemical Society Letters. While looking at alternative designs to today’s current lithium-ion batteries, a team discovered not only a solid-state design, but a set-up that managed to cycle through 200,000 charges. When you consider that the most robust batteries today can manage maybe 7,000 charges, this discovery is pretty significant. Originally, the team was looking at battery designs that did not rely on liquid to hold a charge. That is one of the reasons why lithium batteries have so many restrictions for shipping and storage, because of their liquid content, making them temperature sensitive and combustible. In lieu of liquid, the team used an electrolyte gel, and combined it with gold nanowires instead of lithium to store the electricity. As experiments proceeded, the design was found to be far more pliant than any battery system in use today. 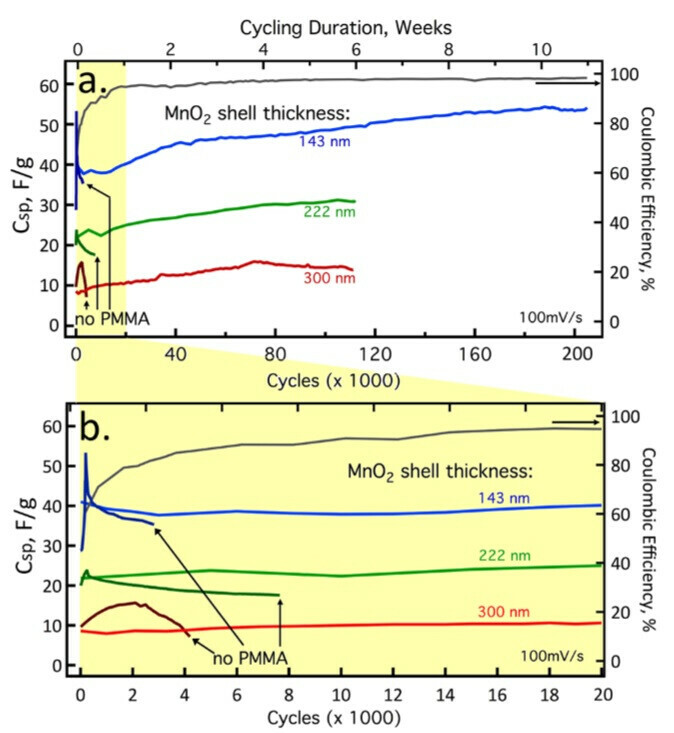 While the use of nanowires in general is not new to batteries, in current lithium systems they grow brittle over time, eventually breaking and losing ability hold power – hence a measurable and foreseeable cycle limit. However, the gold “shell” used in the experimental nanowires keep them from growing brittle and thus continue to handle charging cycles well beyond any projections. During three months of testing, and 200,000 charging cycles, the team at UC Irvine saw no reduction in charge capacity, or observe any damage inside the battery. This does not have any immediate impact for us at the consumer level, we have shared news about apparent battery breakthroughs before. From “non-flammable” lithium ion cells, to “new discoveries,” and “new technologies.” Indeed, better batteries, and battery life in general, are a unicorn in an area where we have seen very slow progress over the years. @Bjray It might be selfish... But in Love and War... Well, you know the rest. Electric motorcycle is the future. While I love my current motorcycle, I think we need a more sustainable form of energy. Fossil fuel is definitely not it. A gear head myself. I hate to see combustion engines go, but there is nothing can stop that from happening. I hope they can make a manual transmission for EVs. Electric steering that can almost give you hydraulic steering feel. More importantly, lighter and safer. Electric car can use hydrolic steering btw..
plain stupid! are you a tree?! oh no you like internal combustion! i agree with green man, i would not even bother to sit in electric car, for sure its future, but not mine. i love the sound, flames out of wastegate, pleasure of fixing it. electric is yes sure power is there always no issues like low rpms and does not need air, so thin air is no problem. best comparison would be go buy toy woman for sure will have all necessary holes etc, me and green man will enjoy good old. no hard feelings here. Well sorry but i hate the current oil market thats stop everyone from evolving so i welcome EVS as soon as possible! Some of the automatic gearboxes today are able to calculate and to act faster than the human will be able to ever do, that's why streetcars should all be automatic. It's nice what you say but on the circuit in a cart or a sport car, on the street I don't want a nut, acting like you have said, loosing control and killing your pedestrian kids. My FZ09 is my fourth and favorite motorcycle so far. But honestly I wouldn't mind going electric. I know it will lose some things but I'm also curious what it will gain. This thing pulls 1G but imagine what electric would do. And I don't need all the noise, I think I'd enjoy just the wind and the birds on a back road. Light, agile, fast, torquey... I have to try it. What electric bike could hold a candle against this 850cc Triple? Zero? No way... Victory Impulse (formerly Brammo)? Ha! That thing can't even keep up with an air cooled 696, let alone FZ09! Maybe a GS500 tops, LOLz! Although Impulse instant torque curve is fascinating... We are talking about R1 level torque here @ ~70ft-lbs give or take which Mr. R1 makes north of 10k rpms... And it's 6-Speedo is an irony in EVs, almost a gimmick, is also cool for die hard manual fans... But it still lack something... Character! go green TREE, go GREEN! this planet cant hold more pollution!!! Hey, I know what you're saying, The FZ09 is a total beast, I love it, best power band I've ever felt for the specs. ( I'm all about the triple) I'm just saying maybe there's more out there to be found. Stick some all wheel drive electric action on a bike and it might just blow your mind. http://lightningmotorcycle.com/ This thing kill all the motorcycle model you gave just go on youtube and put Lightning LS-218 vs Its the fastest consumer motorcycle on the planet. Even at low speeds, you steer with your body, depending on the manoeuvre you want to make. And at high speeds, the arms steer too, depending on the bike type you drive. On an electric motorcycle : Your palm is also accelerator. Your right foot is also rear brake. your left foot also shift gears. Your right finger also control the front brake. your left fingers has no clutch. your arm still steers at low speeds. your whole body still steers at high speed. your thumbs also control the switches your head is still for navigation. So beside some small detail you can almost get the same feel. iPhone 10 with unlimited battery charge! I personally don't think EV's are the way of the future, hydrogen vehicles are. of course we don't see major breakthrough in battery cell technology! u know why?! because that's the big manufacturers weapon to make you buy their products lets say every 3 years max! with gluing batteries to the phone, laptop, music player, etc... board! Now they need to couple it with a superfast charge. What a horribly written article by Maxwell R. If I didn't know any better, I'd say it was written by a seven year old child. Hey look! More battery tech no one will ever see!